The “shock” of the financial crisis continues to impact the economy and peoples’ finances, UK chancellor Philip Hammond has said. Ten years after the financial system went into meltdown, he admitted “people are still suffering the effects”. But he said, in an interview with BBC economics editor Kamal Ahmed, there is “light at the end of the tunnel”. Rising wages and falling inflation were good news, he said, but uncertainty about Brexit was an economic dampener. A decade ago this week, the US investment bank Lehman Brothers collapsed, sending shockwaves through the global financial system. Research carried out for the BBC to mark the occasion showed that wages remain substantially below what they would have been with the crisis. He was “acutely conscious” of the impact on wage stagnation and living. But he added: “We have got through this in much better shape than many of our neighbours. “We haven’t suffered catastrophic rises of unemployment, on the contrary, we’ve seen employment grow by three million jobs over this period. Independent analysis from the Office for Budget Responsibility projected real wage growth over the coming years, he added. 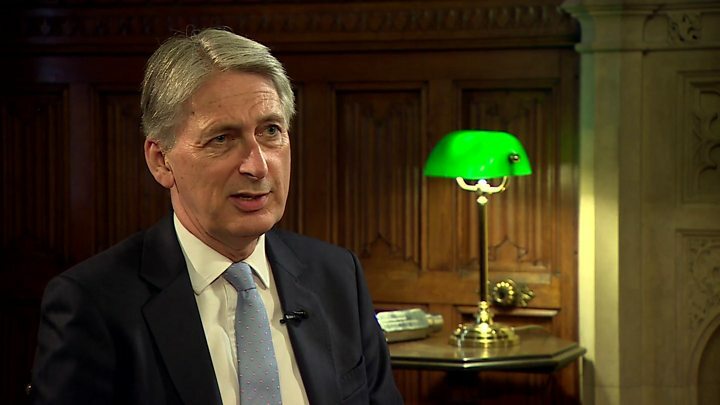 Mr Hammond also defended government efforts to cut debt, which many people argue led to austerity and worsened the impact on peoples’ incomes and the economy. He had, in fact, relaxed fiscal rules when becoming chancellor in 2016, Mr Hammond pointed out. That gave “more headroom” he said. But the challenge the economy faces “is not lack of demand, it’s poor productivity. It we want to see sustainable rises in living standards and real wages, we have to address the productivity challenge,” he said. An impediment to stronger economic growth was uncertainty about the outcome of negotiations to leave the European Union, the chancellor said. Brexit talks were currently “acting as a dampener on the economy”. Mr Hammond said he understood the calls for more spending on, say, the NHS and police. “We’ve made a huge commitment to the NHS, committing to spending £24bn across the UK by the end of this five-year period,” he told the BBC. But he added: “We do have to get our debt down. We have to do that for two reasons: Firstly the cost of our debt, is crippling – £50bn a year of money that we could be spending on schools and hospitals and police forces, being paid out in interest on the debt.